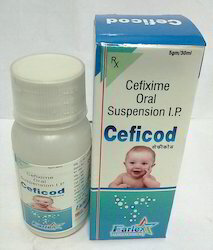 Leading Wholesale Supplier of cefixime oral suspension ip and lycopene syrup for children from Chandigarh. By keeping track with market development, we are involved in offering Paediatric Drops to our esteemed clients. Our offered drops are processed using premium quality chemical compounds by our vendors. Furthermore, a series of quality tests is performed for these drops against several parameters to eliminate any flaw from the entire array. In tune with industry norm, we offer these drops in various packaging options at industry leading prices. With the help of highly skilled professionals, we are engaged in offering a qualitative assortment of Lycopene Syrup For Children. The offered syrup is formulated by the help of finest quality chemical compounds and highly developed technology. Apart from this, this syrup is also examined on diverse parameters by our deft professionals. We pack this syrup in premium grade packaging material to ensure its safety while delivery.